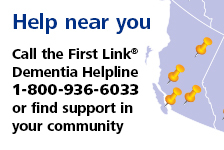 Newsletters & updates | Alzheimer Society of B.C. We have a number of publications for people affected by dementia. Subscribe to receive the next issue. Connections - This quarterly publication features submissions by and resources for caregivers, as well as news, updates and ways to get involved with the Society. Insight - A quarterly newsletter for and by people with dementia. First Link® bulletin - Learn about local support services and education.